Christian Andersen founded Avance Gas in September 2007 together with Stolt-Nielsen, and has served as President since. 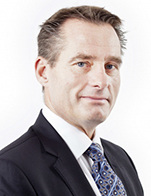 Mr. Andersen has 25 years' experience from the gas industry. He was previously Head of LNG in BW Gas responsible for building up the LNG activity towards customers, banks and yards. Mr. Andersen was founding partner of Amanda LPG Trading, building up a small cargo LPG trader with customers throughout Europe. Mr. Andersen holds a master's degree in business and marketing from Oslo Business School (1986).